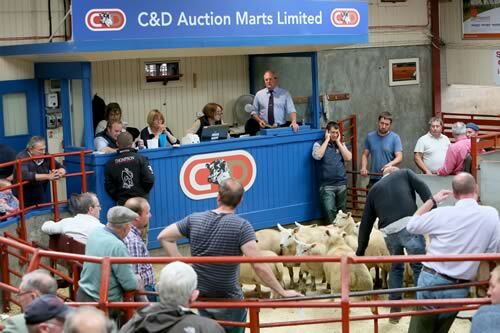 C&D Auction Marts Limited had forward 16 cast cows, 4,298 prime hoggs and 4,414 cast ewes & rams at their weekly sale at Longtown on Thursday 7th February 2019. Another good entry of cast cows were forward and sold to a brisk trade throughout. Beef Shorthorn cows to 133p and 131p shown by A Reid & Co., Glendearg, who also sold Angus cows to 115p, and then to 111p from Messrs Dinwoodie, Archerbeck. Simmentals to 110p from Archerbeck. Top price per head of £786 for a Beef Shorthorn from Glendearg. More cows required on a weekly basis to fulfill demand. The 4,298 prime hoggs were another fantastic show for quality with many outstanding pens of export Beltex and Texel hoggs forward. Trade for these hoggs would be 230-280p per kilo regularly, with a top of 305p for Beltex hoggs from DS & RC Taylor, Easter Ochtermuthill, Perth. Commercial hoggs all sold around the 210-230p per kilo mark. Another outstanding entry of heavy hoggs were very easy to sell with most making between 185-200p region. Top price per head of £126 for Texel hoggs shown by Douganhill Farm, Orchardton Mains, Castle Douglas. Suffolks sold to £100 from Auchengray, Archerbeck & Aton, with Greyface hoggs to £100 from Aton and Cheviots selling to £86 from Allfornaught & Commonside. Light hoggs all sold around the 200p per kilo mark to a top of £69 or 216p for Texel hoggs shown by WH & M Sisson & Sons, Fenton, Brampton. Overall average of 192.4p, which was 2p down on the week, with an SQQ average of 200.5p, which would be higher than earlier weeks market averages. Beltex 305p Easter Ochtermuthill, 295p Brisco Meadows, 290p Craigow, 289p, 283p Hollands, 283p Killocraw, 282p Cuiltburn & Hollands, 281p Brisco Meadows, 277p Cuiltburn, 276p Newton Cottages, 273p Easter Ochtermuthill. Texel 260p Muircleugh, 253p Kilnhill, 251p Myrelandhorn, 246p Newton Cottages, 239p Copperthorns, 238p Peela Hill & Aldermanseat, 237p Carsloe & Fenton, 236p Allanshaws, 234p Wallend, 229p Gate Ghyll, 228p Langdyke Cottage & East Raffles, 227p Braithwaite Hall & High Parkfoot, 225p Brae Edge. Suffolk 217p, 209p Broomhill, 205p Craigow, 203p Glenehervie & Gartvaigh, 201p Copperthorns, 198p Archerbeck, 194p Glenehervie, 193p Copperthorns, 192p Ashley Park & Hepplehill, 190p Allanshaws & Craigow. Blackface 215p Arnicle, 209p Horseclose, 207p Woodfoot, 206p Glenshanna, 202p Corsebank, 201p Carsewalloch & The Steel, 200p Mid Harrietsfield, 198p West Scales & Corsebank, 196p Arnicle, Culquhasen, Burnfoot & Merkins, 195p Chirdon, Milnmark, Merkins & Knockreoch. Cheviot 212p Craigow, 204p Hepplehill, 196p Cross House, 195p Brisco Meadows, 191p Allfornaught. Herdwick 204p Orthwaite Hall, 200p Longrow Cottage. Charollais 201p Archerbeck, 200p Ashley Park & Cleongart. North Country Cheviot 201p Micklethwaite, 192p Allanshaws. Mule 198p Glenehervie, 197p Gartvaigh, 195p Arnicle, 194p Gartvaigh, 191p Linglie. Cheviot Mule 198p, 193p Allanshaws, 192p Craigow, 190p Longrow Cottage. Swaledale 175p Woodhall, 174p Burn House, 173p Woodhall. Texel £126 Orchardton Mains, £122 Chirdon, £120 Muircleugh, £117 Aton & Muircleugh, £116 Aton & Meikle Fieldie, £115 Chirdon & Brae Edge, £114 Meikle Fieldie, Duke Street & Allanshaws, £113 Orchardton Mains & Myrelandhorn, £112 Skitten & Muircleugh, £111 Dunjop, £110 Meikle Fieldie & Muircleugh. Beltex £119 Easter Ochtermuthill & Newton Cottages, £118 Kilnford Croft & Brisco Meadows, £116 Hollands & Cuiltburn, £114 Newton Cottages & Cuiltburn, £113 Hollands, £112 Easter Ochtermuthill & Hollands, £111 Cuiltburn. Suffolk £100 Auchengray, Archerbeck & Aton, £94 Fellend & Fearn, £93.50 Oswie & Fellend, £93 Kilnford Croft, £92.50 Barnglies, Broomhill & Beechgrove, £92 Fenton & Allfornaught, £91.50 Cowburnrigg & Fearn, £91 Sceugh Dyke & Kilnford Croft. Mule £100 Aton, £96 Dunjop, £94.50 Kirkhouse, £93 Whitchester, £90 Mid Harrietsfield. North Country Cheviot £90.50 Newton Cottages, £89 Micklethwaite, £85 Cronklea. Blackface £87.50 Glenshanna, £83.50 Linfairn, £83 Skelfhill, £82.50 West Scales & Glenshanna. Cheviot Mule £87, £81 Upper Kidston. Cheviot £86 Allfornaught & Commonside, £85.50 Newton Cottages, £84.50 Barnglies. Herdwick £79.50 Orthwaite Hall, £76 Longrow Cottage. The 4,414 cast ewes and rams were a similar show for numbers, with the usual large ring of buyers was operating and trade was buoyant throughout with prices slightly firmer on the week. The best Beltex and Texel ewes again sell at a premium with 461 ewes selling at £100 and over to average £124.62. Top price of £158 for Texel ewes from M Reid, Grassmainston, Stirling, Heatherglen & Aton. Hill ewes to £75 for Cheviots shown by Playfair Farms, Morebattle Tofts, Kelso. Texel rams to £122 from Muircleugh Partners, Muircleugh, Lauder. Texel £158 Grassmainston, Heatherglen & Aton, £156 Meikle Fieldie & Heatherglen, £154 Muircleugh & Graceside, £153 Lintley, £148 Skitten & Graceside, £147 Muircleugh, £146 Allanshaws, Mindrum & West Wharmley, £145 Aton, £144 Great Orton & Greenwood, £143 Laurels, £142 Aton, Heatherglen & Nether Stenries, £141 Beechgrove & Allanshaws, £140 Fairview Bungalow, Aton & Meikle Fieldie. Beltex £147 Finnieness, £140 West Cottages, £137 Great Orton, Beck Farm, £133 Viewley, £130 Kilnford Croft. Charollais £128, £120, £109 Viewley. Suffolk £118 Allanshaws, £114 Kilnford Croft, £105 Nether Stenries, £104 Shaw Cottage South, £102 Viewley, £100 Nether Stenries, Larglea & Forss, £97 Allanshaws, Shaw Cottage South & Eastside, £96 Beechgrove & Shaw Cottage South. North Country Cheviot £106, £94, £92 Allanshaws, £90 Myrelandhorn. Zwartble £92 Nether Stenries & Mindrum. Cheviot Mule £90 Muircleugh, £88 Nether Stenries, £87 Halldykes & Seymour House. Bluefaced Leicester £87 Springwells, £86 West Nubbock, £84 Frankstown. Mule £80 Seymour House, £76 Hill House & Willimoteswick, £75 Weary Hall Style, £74 Halldykes, £73 Hallburn, £72 Chirdon, High Hall & Cloggers Cottage, £71 Frankstown, Trailtrow, Beechgrove & West Wharmley, £70 Sowerby Wood. Cheviot £75, £70 Morebattle Tofts, £70 Orchardton Mains, £69 Skelfhill, £67 Commonside & East Deloraine, £65 Cloggers Cottage. Blackface £68 Merkins, £67 The Steel, £65 Peela Hill, £64 West Nubbock, £63 Ralphshield. Swaledale £60 Orthwaite Hall, £56 West Nubbock. Kerry Hill £57 Westerton Cottage, £54 Willimoteswick. Easycare £56 Morebattle Tofts, £55 Synton Mains. Texel £122 Muircleugh, £117 Allanshaws, £111 Orchardton Mains. Suffolk £115 Larglea, £110 Beechgrove. Bluefaced Leicester £108 Chirdon, £95 Eastside & Tecket. North Country Cheviot £94 Allanshaws.